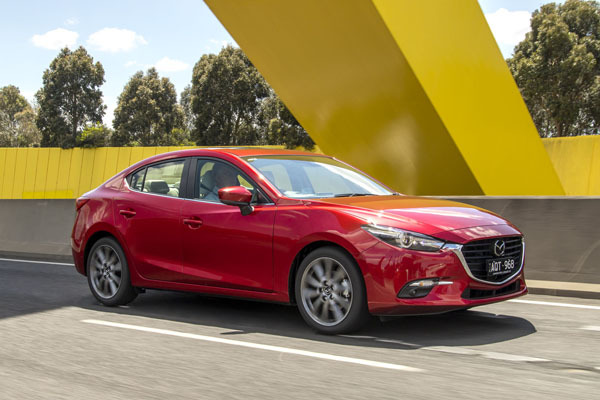 The Mazda3 marches on as one of the most popular cars on the Australian market with upgrades to its lower end models for modest increases in price. A range of equipment has been added to Neo, Maxx and Touring grades across hatch and sedan variants. Buyers of the top-notch SP25 and SP25 GT are the big winners with driveaway matching the manufacturer’s figure before on-road costs. The Mazda3 SP25 continues to feature advanced keyless entry, dual-zone climate-control, electric parking brake, headlamps auto on / off and 18-inch alloy wheels, while the range-topping SP25 GT adds colour active driving display, LED daytime running lights, driver attention alert, adaptive LED headlamps, heated power mirrors, plus traffic sign recognition. It was the SP25 GT six-speed automatic, selling for $31,990 driveaway, that was on test. Coming to Australia at the beginning of 2014, the Mazda3 carries through the company’s Kodo – Soul of Motion design theme. The cabin is positioned toward the rear of the body, creating a sleek side view, rising toward the rear. A new deeper front grille adds a more aggressive design as do the shaping of the LED headlamps and foglights. The Mazda symbol and number-plate holder are low on the front grille to give the sense of a lower centre of gravity according to Mazda. Large 18-inch wheels – the SP25 GT with unique design sig inside enhanced by flared fenders. Folding mirrors complete the high-end character. Mazda’s Commander control and related feature a layout focusing on the shift lever, while soft pads with double stitching are fixed to the sides of the console for added comfort. A colour Active Driving Display registers vehicle speed, information from the navigation system and other information on a clear head-up panel directly in front of the driver. 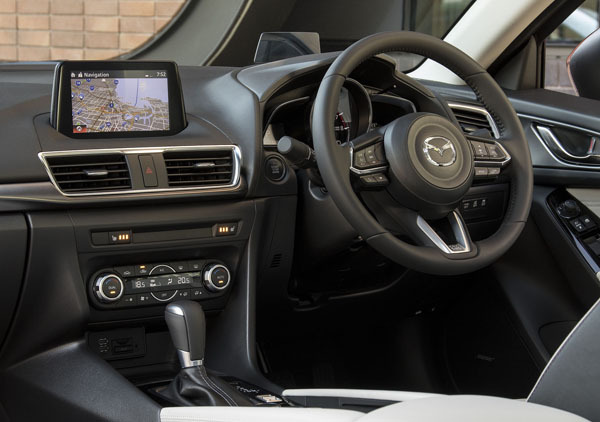 A head-up style Mazda Human-Machine Interface, using a high-set full-colour screen, aims to help drivers maintain proper posture, concentrate on the road and drive more safely, even while handling larger amounts of information. However, drivers should still pay attention to the road and avoid dangerous distraction. Mazda’s MZD Connect, works in conjunction with a smartphone to provide an internet connection and communication functions. The system can read email and short messages aloud while the vehicle is in motion using text-to-voice technology. It can read aloud the latest Twitter tweets and Facebook news feed entries, and also posts audio messages using the Shout function. A navigation system with data provided on SD media cards is available in conjunction with MZD Connect. Again, we warn you of the dangers of inattention. Lower grades of the Mazda3 make use of the SkyActiv-G 2-litre four-cylinder engine, putting out a maximum of 114 kW and 200 Nm. The SP25 GT, our test car, takes advantage of the SkyActiv-G 2.5-litre motor producing 138 kW of power and 250 Nm of torque. The test vehicle powered trough a six-speed automatic transmission. Four exhaust pipes running from the exhaust manifold first form pairs, then a single pipe allowing greater distance for the exhaust gases from individual cylinders to travel before merging. This reduces exhaust resistance to enable efficient combustion. In addition, the loop design of the exhaust pipe saves space, allowing the large-capacity catalytic converter to be positioned near the engine, reducing vibration. The Mazda3 has a wide range of Mazda’s advanced safety technologies, collectively known as i-Activsense. These include hill launch assist, smart brake support and city brake support, emergency brake signalling, traffic sign recognition, blind spot monitoring, lane keep assist and driver attention alert. Rounding out the list are radar cruise control, forward obstruction warning and adaptive LED headlights. A head turner when it first came out, the latest Mazda3 has been so successful that it seems to be on every street corner. The SP25 GT takes pride of place in the line-up. Safety and even better handling are provided by Mazda’s G-Vectoring, which brings together G-forces when braking, turning and accelerating. For example, there’s less driver correction to steering due to optimum vertical loading of each tyre. All this goes on without the driver being aware, apart from the smoothness of vehicle’s behaviour. Extra performance can be called up by going into Sport mode via a switch on the auto transmission shift gate. ‘Sport’ spices up the engine, shift timing and shift speed, boosting acceleration, even with light pedal pressure. Re-positioned A-pillars and side mirrors, the latter now mounted on the doors, make for much improved visibility for the driver and front seat passengers. In fact, all occupants enjoy an expansive view. 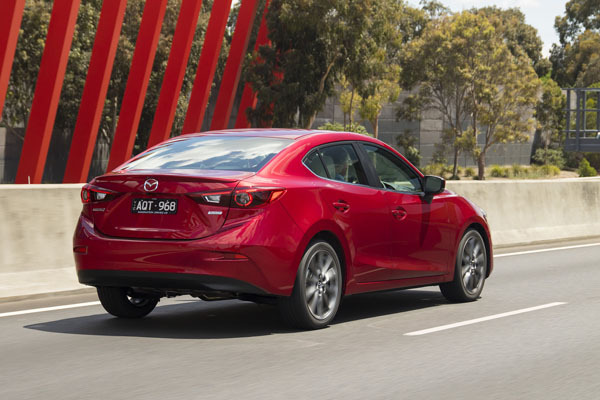 The figures tell the tale, Mazda3, one of Australia’s most popular cars, pretty much sells itself. The SP25 GT, at $31,990 on road, for my money, is the pick of the bunch. – Note these are driveaway prices.